This is the first of two articles about preservation efforts in Newark. Individuals, agencies, and committees in Newark have been actively involved in saving old and historic sites and landmarks for nearly a half-century, sometimes meeting with success and sometimes falling short of their desired goal. Nevertheless, preservation, no matter what the form is here to stay and it will grow and grow as people realize it will make for a more attractive city, help maintain the tax base, lure tourism into some of Newark’s most interesting neighborhoods, provide a modest but substantial income for local craftspeople, and in general make the city simply a more pleasant and attractive place in which to live and work. Look at some of the great old structure around town with their high ceilings, intricate cornices, exterior decoration and sculpture, as well as the way they are situated on their particular piece of property. These are things you will hardly ever find in a new building. The elegance of another era is often not replicable because the craftsmanship is no longer available, or the price of reproducing the architectural element is too expensive. Just look at a turn-of-the-century mansion in the City’s Forest Hill section and compare it to one of the new homes advertised in the Sunday real estate section in a wealthy outlying community. There usually is no comparison. In a nation hell-bent on pursuing eternal youth – an old building frequently has a great deal to offer over a new one. It’s cheaper, it’s prettier, and it’s available for a reasonable price. Perhaps the best example of a private residence preservation effort in Newark occurred in the 1950s when D.J. Henderson and his wife Betty began the restoration of Sydenham House. Today, the building stands as one of the best 18th century restorations in northern New Jersey. 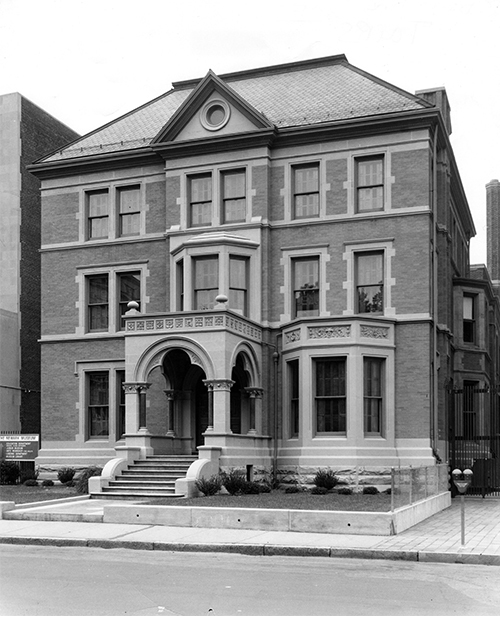 The Ballantine House, part of the Newark Museum, was skillfully returned to its original Victorian grandeur, and has become a standard for Victorian preservation in the state. The museum's talented curators and skillful administrators have provided Newark with a state landmark that draws many visitors. Presently, the city is deeply engaged in the restoration of another great landmark, the Krueger-Scott Mansion on High Street/King Boulevard, which is expected to be another architectural showstopper in the near future. Hartz Mountain has established a new standard for a commercial building restoration with the complete renovation of the old Gibraltar Building. Cass Gilbert, the building's famed architect and also designer of the U.S. Supreme Court Building in Washington, would have been pleased with Newark's efforts. Finally, the city's Pennsylvania Station is undergoing a complete renovation under the watchful eyes of New Jersey Transit. With these typed reports the basis was laid for more detailed work by later committees. Newark's second landmark committee was created in March 1973, largely through the efforts of Donald T. Dust, at that time an employee of the Greater Newark Chamber of Commerce. Today, several decades later, the original handful of Newark Preservation and Landmarks and committee members has grown to more than 200 living in Newark and New Jersey and beyond. Donald Dust's total absorption in the local landmark scene was described by Douglas Eldridge some years ago as a 'person who wrote, talked, invested, marched, negotiated and sacrificed for (the cause of Newark architectural integrity).' The committee's first members were selected by then-Mayor Kenneth Gibson and the Chamber, but soon the organization became independent and non-profit with a variety of responsibilities. Its 240 members, and the board, have acted as citizen watchdogs. Through education they instruct others, and also hold exhibitions, sponsor tours, and publish a wide variety of publications, including greeting cards, tour guides, and the memoirs of William M. Ashby, a prominent civil rights leader. More than 60 plaques have been installed on buildings the committee has cited, and many well-written nominations for the historical, state and national registers, written by Ulana Zakalak, have been sponsored by the committee. Listing in these registers have generated several million dollars in funds made available to owners wanting to restore their buildings. In addition to including building nominations, the committee has established three historical districts: Forest Hill, Lincoln Park and James Street. To assist in the support of Newark's architectural legacy, a second landmark agency, the Newark Landmarks and Historic Preservation Commission, came into existence in January 1990. Its chairperson, Elizabeth Del Tufo, a nine-member board, and two alternatives, were sworn into office at that time. The commission's first act was to establish a legal document designed to protect Newark's registered historic sites and districts, and to have the right to nominate future sites and districts to a city register of historic places. After a great deal of time, effort, and energy, the Newark ordinance was signed into law in 1994, creating in Newark, as in other major cities in the United States, a procedure for protecting the city's architecture. Basically, the new ordinance was drafted to ensure that '… a structure could be protected from neglect, misuse, incorrect alterations, additions and demolition.' With its power, the agency can now operate independently with the force of a municipal agency. Since its inception, the commission has produced a brochure for owners of historical structures and recently pursued the removal of signs from the front doors of both City Hall and the Hall of Records. Today, there are two guardians of our architectural treasures: the committee, which serves as a consulting agency, and the commission, which has the force of law behind it.